Capture the exuberance of womanhood in its full glory that will bring out your fragility and femininity with this classic necklace set in mala style. 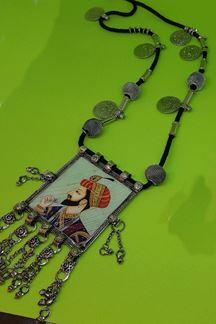 Fancy beads having floral design carved on it and the alternate design pattern in which the beads and pearls are placed. Necklace is hand worked with pretty American diamonds in a ball-like structure. Earrings are designed similar to the necklace giving awesome look. 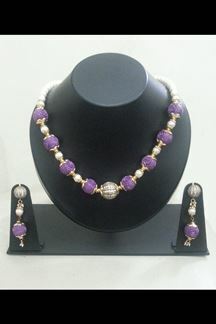 necklace set is plated with 22kt gold. Size of the necklace is 15” and of earrings is 2” approx. Note: Please note that the Free Shipping offer doesn't apply to any products purchased under the Accessories Section. Shipping charges will apply. Shipping charges will be waived off only if the product is bought along with any product under the following categories - Sarees/Lehengas/Suits/Gowns/Kurtis.